Sri Lanka will continue their tour of South Africa with a three-match T20I series from March 19th to March 24th. 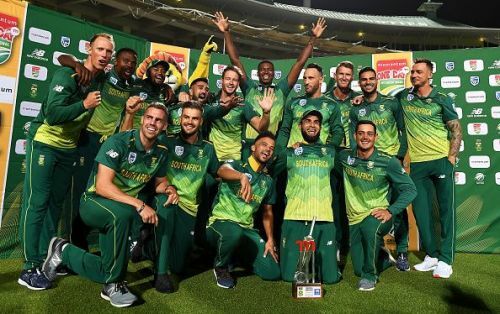 The ODI series was completely one-sided as the South Africans eased to a 5-0 victory, having barely faced any competition. The Proteas faced a setback in the Test series but made a good comeback in the ODIs with a complete whitewash. They will look to continue their winning streak in T20Is as well. They have announced two squads, with just a few minor changes. Uncapped Sinethemba Qeshile has been named in the squad for the final two matches. JP Duminy will be captaining the side in the absence of Faf du Plessis who will play only the first match. JP Duminy (C), Reeza Hendricks, Aiden Markram, David Miller, Chris Morris, Anrich Nortje, Andile Phehlukwayo, Dwaine Pretorius, Sinethemba Qeshile, Tabraiz Shamsi, Lutho Simpala, Dale Steyn and Rassie van der Dussen and Imran Tahir. After a humiliating loss against the Proteas in the ODI series, Sri Lanka will hope for a turnaround in fortunes. However, they have already lost one of their best players Kusal Perera to injury. Lasith Malinga will be in charge of the inexperienced Sri Lankan side. They will be highly dependent on players like Malinga, Thisara Perera, Kusal Mendis, Suranga Lakmal, Niroshan Dickwella and Akila Dhananjaya. Avishka Fernando, Angelo Perera, Dhananjaya de Silva, Priyamal Perera, Isuru Udana, Thisara Perera, Niroshan Dickwella (WK), Kusal Mendis, Sadeera Samarawickrama, Lasith Malinga (C), Kathmandu Mendis, Suranga Lakmal, Asitha Fernando, Jeffery Vandersay, Akila Dhananjaya and Lakshan Sandakan.